Some time ago I came across a dentist and a physical therapy clinic (PT) in the same area of town. Both had one doctor on staff. Similar sized offices. Same client base. So, I figured they’d also have similar revenue, even considering the differences between dental clinics and physical therapists. 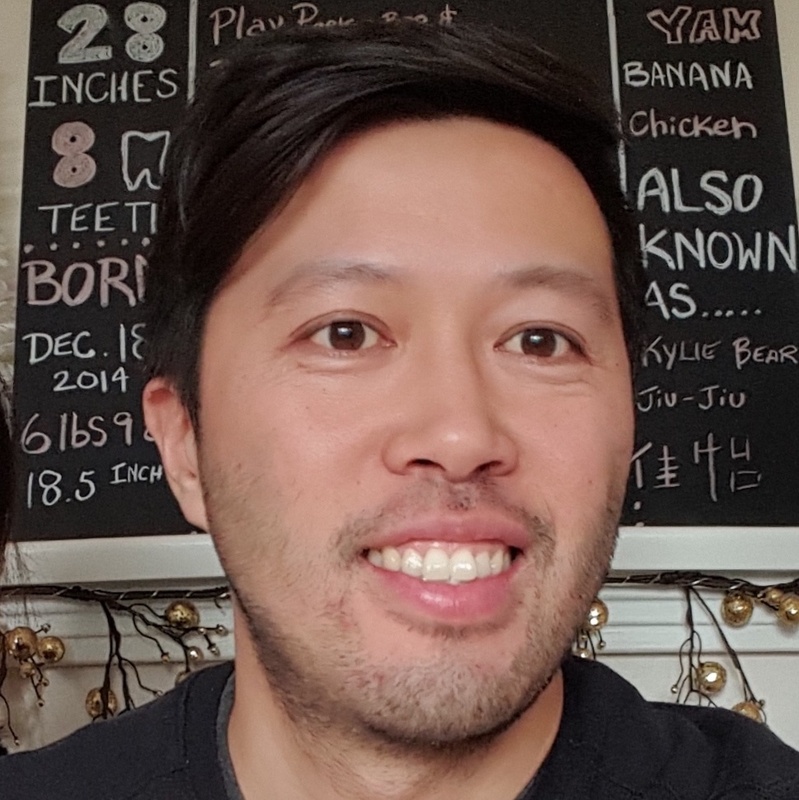 The PT clinic had nearly twice the revenue as the dental clinic. How could this be? I started digging. The PT clinic must have better marketing. But when I went online, the dental clinic was actually doing more marketing than the PT clinic, and it wasn’t any better or worse. More referrals maybe? Better service? They had pretty similar online reviews, mostly high. There was no clear reason why one clinic should be so much more profitable than the other. I started examining their numbers. I started measuring the clinic metrics that relate to patient experience operations, such as phone answer rates and booking rates. And then, the answer become clear. The physical therapy clinic’s call tracking metrics were outstanding. They were above the 95% phone answer rate all clinics should be above. Even better, they were booking nearly 80% of new patient callers for appointments. The booking rate and call metrics at the dental clinic told a different story. They were hitting about average for what I’ve seen across the industry while measuring call tracking metrics for hundreds of clinics. Average is a 70% phone answer rate, and a 60% booking rate. Let’s do the math – also keeping in mind that industry wide, about 10% of callers to clinics tend to be new patients. 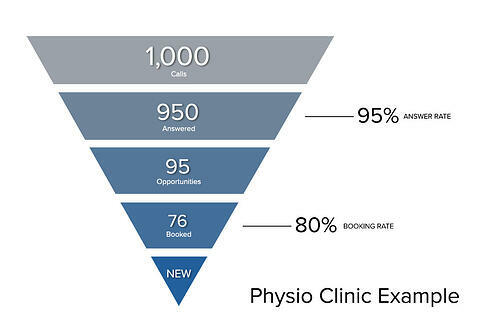 The call funnel simply describes the journey from a new caller through to a booked new patient in your schedule. 70% answered, 60% booked, means only 42% of new patients calling the dental clinic were getting booked for appointments. 95% answered, 80% booked, means 76% of new patients calling the physical therapy clinic were booked. Notice the HUGE difference based on the same 1000 phone calls! 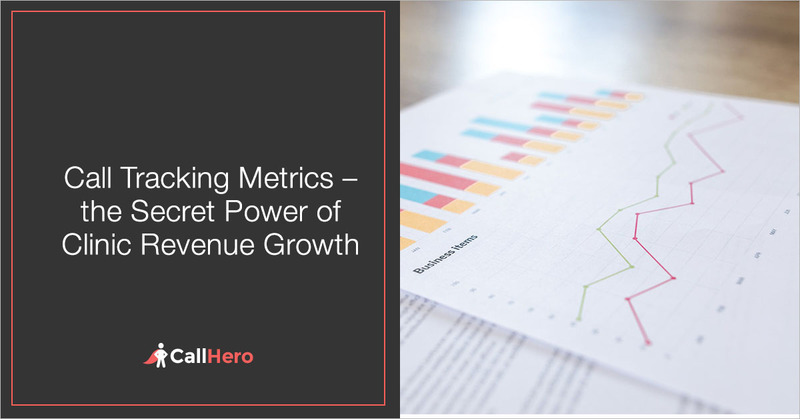 Only by measuring call tracking metrics can your clinic know if you’re making the revenue you should be making. And we can find all this out beginning with simple call tracking. Why Do Your Online & Doctor Marketing Not Seem to Be Working? Far more often than not, it has little to do with your healthcare marketing. 1) They set a goal to raise revenue, and craft a marketing plan to reach the goal. This should actually be the last step, not the first, as you’ll see in a bit. 2) They assume their systems, their patient experience operations, are working great. It’s almost never true. 3) They hemorrhage patients to other clinics, beginning with their poor phone service, and have no idea it’s happening because they aren’t doing call tracking or measuring other metrics. 4) When their revenue fails to reach the level they expected, they draw the wrong conclusion and blame their marketing. I’ll say it again – your marketing is very rarely the problem. The reality is, you get what you measure. The truth is, your profits reflect the success of your patients. And success begins on the phone the first time they call you. You’re probably a terrific practitioner. Honestly, most are. That’s not a differentiator. What matters far more is the patient experience, which you must begin measuring from the moment they call using call tracking and other call center metrics for your clinic. If a new patient calls your clinic, doesn’t feel any warmth on the other side of the line, gets put on hold with little warning, and doesn’t get followed up after they hang up from the wait – it doesn’t matter if you’ve been on Oprah. That patient will go somewhere else. And you missed your chance to win their business. That patient did not succeed at your clinic. He never even reached the front door! Get some benchmarks and see how you compare to clinics in your community. If your clinic only answers the phone 60% of the time, you need to know that. There’s little sense in making any changes until you know the present reality. And to be clear, it’s not something to get upset about if you discover your call tracking metrics are in the sewer. It’s something to build on. If your booking rate is 80%, you need to know that too, because that’s a great number and now you’ll know you don’t need to focus on that as much. Seems kind of obvious when you start thinking this way, right? 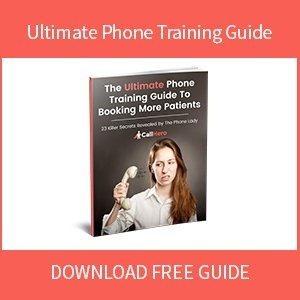 If your phone answer rate stinks but your booking rate is strong, then find trainings like phone scripts and other tools that will help improve your phone answering service. CallHero software specializes in this kind of phone script training. We have all kinds of scripts and other trainings that come as part of our call tracking software. You won’t solve all the world’s problems with one training (you didn’t just practice on one patient in your own training did you?). After training once, with call tracking and call recording, your team can listen to themselves, discuss how the calls went, and work on ways to improve next time. Maybe get more training on more advanced techniques to build on the initial training. You see, millions are made in inches, not miles. Tiny gains each week in your clinic operations will yield exponential results each year afterward as long as you keep building on the previous week’s successes and failures. You’ll never answer every call. Your staff only has two ears each and so many people. But with call tracking software, you can keep track of missed calls and callers who didn’t book. With these lists readily at hand and armed with proven phone scripts, you can call these people back and win some of them back. Even if you only winback one out of ten – how much is that one patient worth? We have customers who are using CallHero to winback 2 extra new patients each week (8 per month). And do you know how many other clinics (or ANY businesses for that matter) call people back? Hardly any! Your service and care will leap out of the phone because no one else does anything like this. See how this works? Your primary task is to perfect your patient experience and clinic operations by using call tracking metrics, phone scripts and other trainings, ongoing optimization and improvement, and other strategies. Get your answer rate up to 95%. Get your booking rate up to 80%. Once that’s happening, then it will finally be worth it to take a fresh look at your marketing. 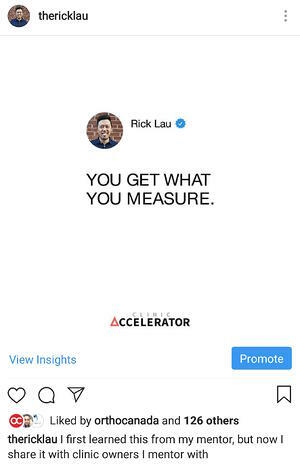 You can go start measuring things like your online ads, your doctor marketing, your social media, and the countless other ways marketing can be done. But you must first optimize your clinic operations, and that begins with call metrics tracking. There’s another reason why it’s so vital to do this process in this order. If you have any interest in opening up a second clinic, you need to get your first clinic humming on autopilot first. Your greatest priority is to optimize your patient experience and clinic operations, and maximize your revenue at your first clinic. Then, and only then, is it wise to start thinking about a second clinic. But if you’re holding your current clinic together with bandaids and bubble gum, you can pretty well assume your second clinic will do even worse. Managing two is always harder than managing one. The call tracking process begins with a very simple tool. It’s called CallGrader. CallGrader measures your phone answer rate over a period of a few weeks. You’ll get a simple report – how many calls came in, how many got answered, how many went on hold, and some other related call tracking metrics. Best of all – if you click the button below – you can use CallGrader for FREE. When I started my clinic, this DID not exist. Nothing even close to this was available. But today, you can get it right here, with the click here.